Need a quiet spot to check your email? Looks like for many people, that’s the bathroom. According to a new study from Adobe, 42 percent of Americans use their time there to check their email. This result is part of a wider study Adobe did to look at trends in email usage — something the company obviously cares about given the email marketing services it offers. To some degree, Adobe’s results aren’t all that surprising. Ninety-one percent of respondents said they check email at work and 87 percent check their work email at home and 70 percent check their email while watching TV. 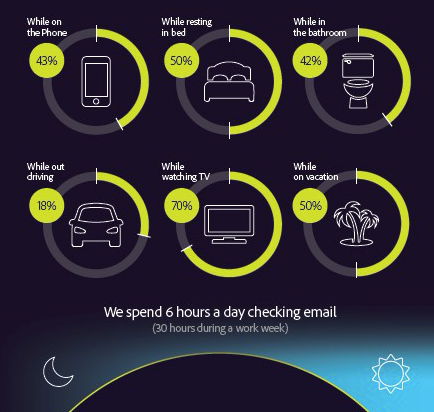 About half the respondents said they check their email in bed and while on vacation and — somewhat worryingly — 18 percent check their email while driving. Even more concerning is that the number increases to 27 percent for those between 18 and 34. What’s most surprising about the results, though, is that millennials — the age group most highly coveted by marketers these days — is just as addicted to email as everybody else. They are more likely to check their email on mobile, but they also check their email more often than other age groups. That’s despite the proliferation of messengers, Instagram and other tools to stay in touch. And when it comes to addiction, people are clearly aware of their bad habits because four out of ten respondents say they tried a “self-imposed email detox.” Sadly, the study doesn’t tell us if that really worked for them, but 87 percent of those who tried said they managed to go without checking their mail for an average of five days. It also doesn’t look as if tools like Slack, Convo and Yammer have made a huge dent in the corporate world yet when it comes to email; half of the respondents actually expect that the email volume they have to deal with will go up in the next two years. All of that, of course, will make email marketers happy (though given that the survey was commissioned by an email marketer, you probably want to take the results with a grain of salt). As long as they don’t overdo it (a third of respondents would like to see fewer repetitive emails from brands), email will remain a valuable marketing channel for them for the time being. If anything, it’s not nearly as dead as many of us would like it to be.